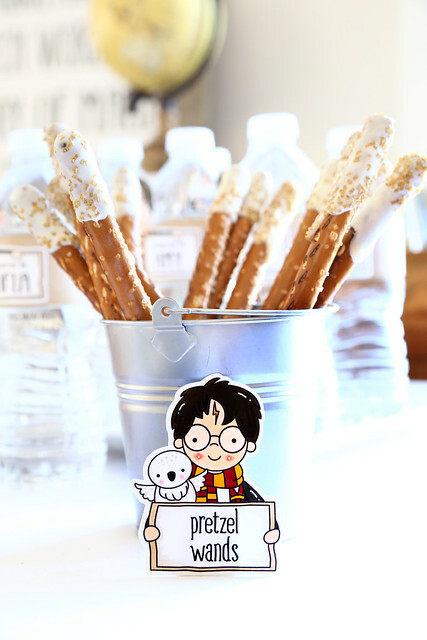 Just ME: Harry Potter party! I looked around, but didn't find what I wanted, so I drew my own images for the party. They are available in my etsy shop - CLICK! This party was so much fun to put together. There are so many ideas out there for foods and desserts, and I picked my favorites and ran with it. Let's take a closer look at everything! 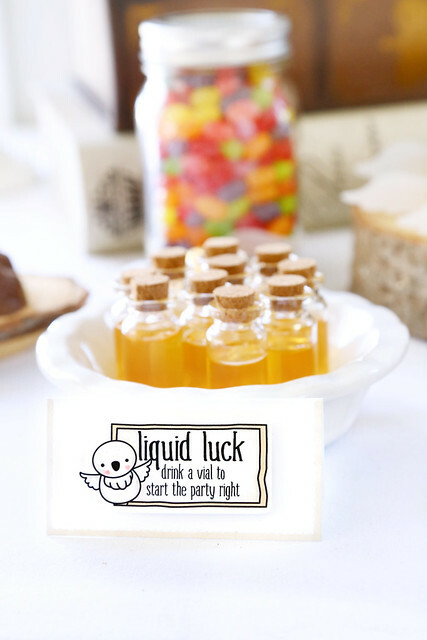 When the girls came in, I gave them each a little vial to drink to start off the party. They thought it was hilarious. Sparkling peach juice! 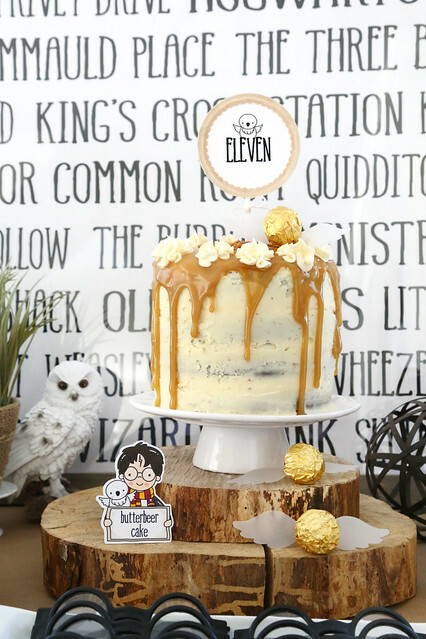 The butterbeer cake was obviously homemade! Everything was, and I'm really proud of that. You can throw your kids a party on a budget and still have it look amazing. 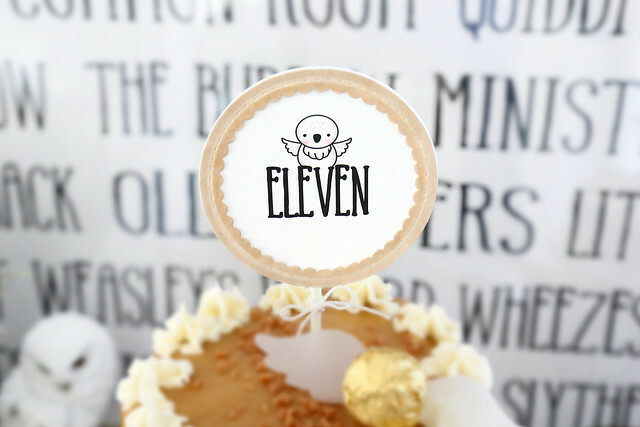 I manipulated the Hedwig graphic to create a simple cake topper. 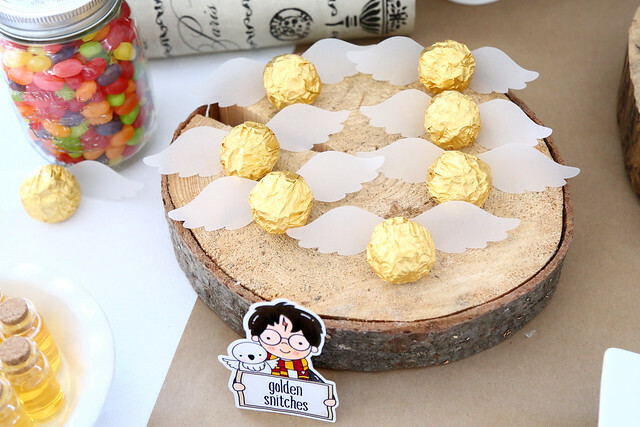 Some vellum wings glued to Ferrero Rocher chocolates made for the cutest golden snitches. 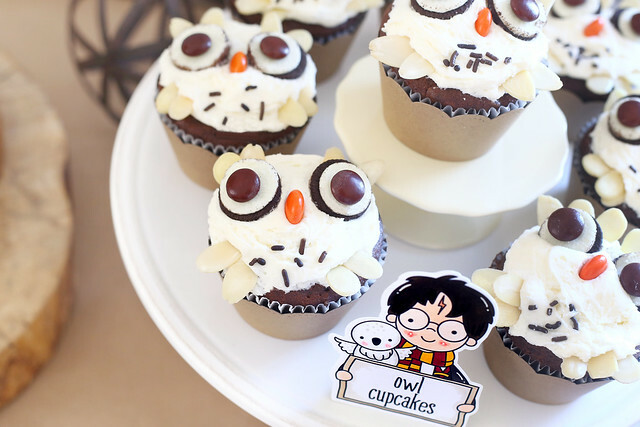 I found a tutorial online for decorating owl cupcakes. They are like teeny baby alien owls, ha. Here's a party tip for you: I always bake a smaller cake (like, recipes usually are geared for 8 or 9 inch cakes, and I bake mine in 6 inch pans.) This way, there is enough leftover batter to make cupcakes! No extra baking required. I ended up with 8 extra cupcakes, and they all went on the table. Same cake, same frosting, just differently decorated. Jelly beans are my kryptonite. I can willpower-myself into avoiding cake and chips, but I double-fist jelly beans like it's my last day on earth. oh boy. Apart from baking the cake, this was the easiest party to put together (dessert-wise.) 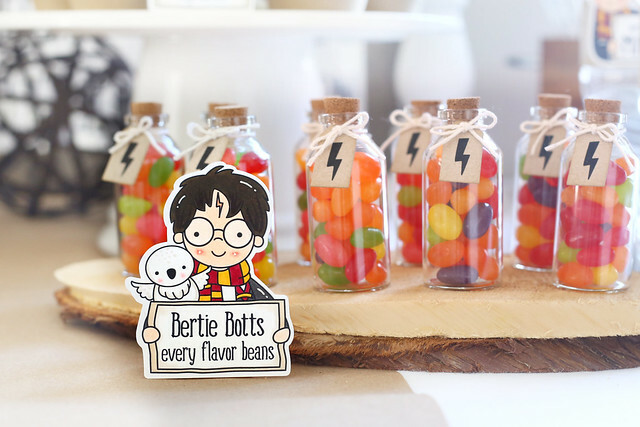 I mean, jelly beans in jars? I can handle that. Dipping long pretzels into chocolate? Got it. 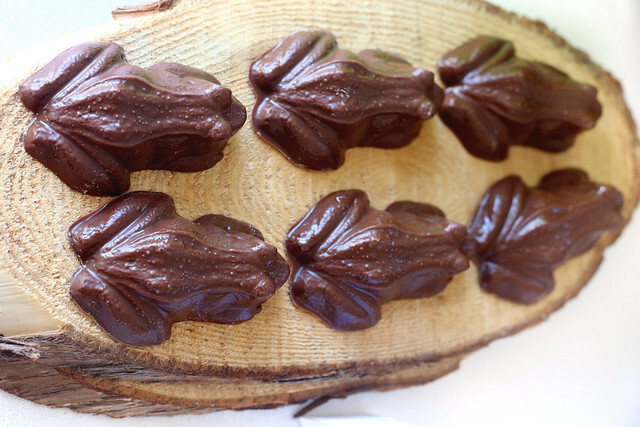 Melting chocolate into frog molds? No problem. 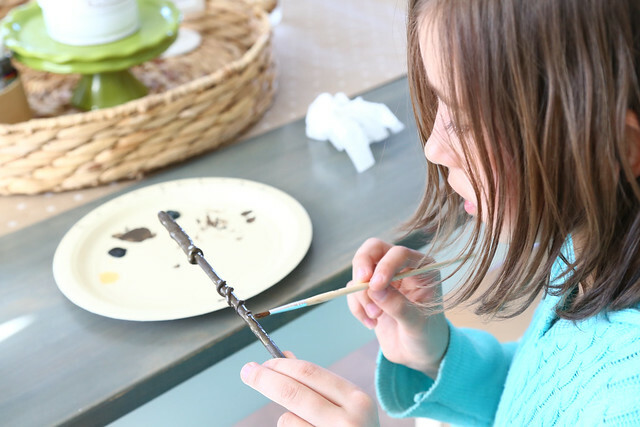 I found a tutorial online for wrapping hot glue around chopsticks, and then painting it. 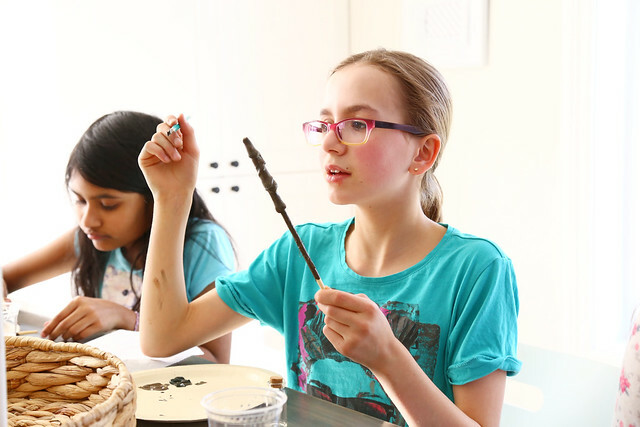 Sofia and I did the hot-glueing ahead of time, and they were able to paint their own magic wands! I found this graphic online, but recreated it for our party because I wanted the fonts to be consistent throughout. The poster, printed on engineering paper at Staples, was 18x24 inches and only costed 2$! I added another dollar to purchase a foam core board of the same size, and glued them together for stability. 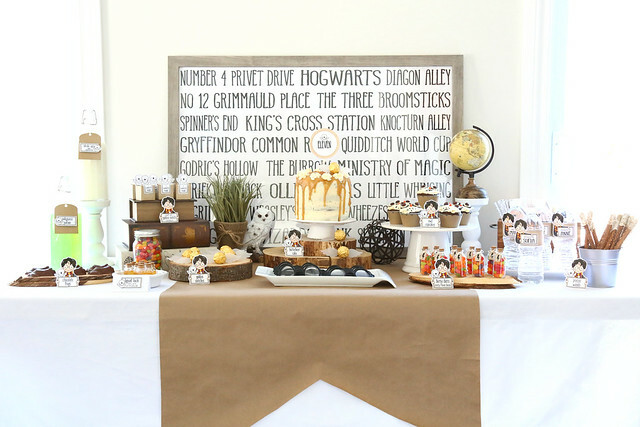 The backdrop for the dessert table (scroll up to see the full party shot at the top) was created in the same way. 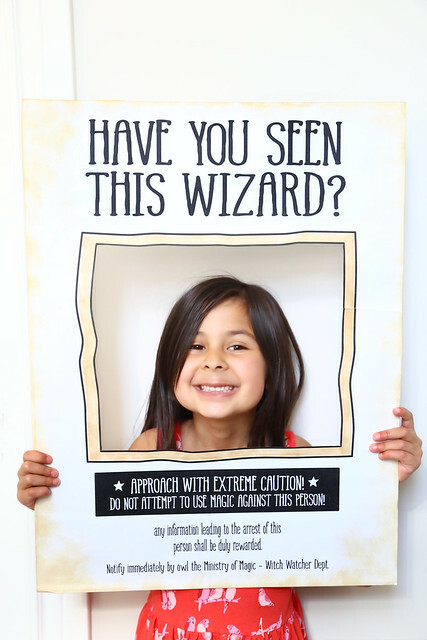 I just typed up Harry Potter "locations" and had the file printed onto a 24x36 inch engineering print. It was under 5$! We had a frame that size which I borrowed for the event. Super easy! Who knew the snitch wings made such great mustaches? ha. And I love that Sofia let her little sister tag along all day! To finish off, the girls got to take home their wands, all the jelly beans they could carry (because I can't control myself around them!) 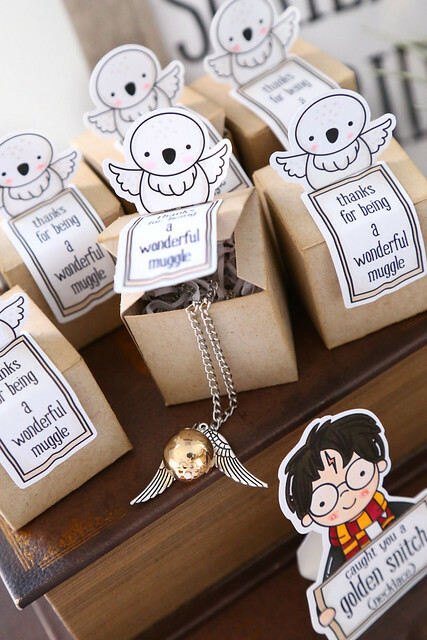 and a little box containing the cutest golden snitch necklace. 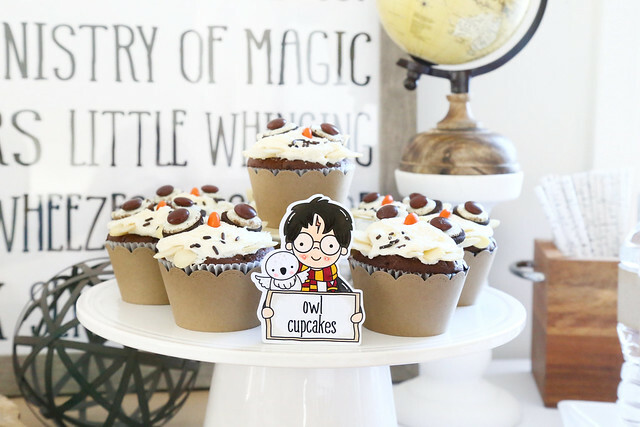 I hope you've enjoyed this look at our Harry Potter party! It was so much fun to put together! If you'd like to check out the party invitations, click HERE. 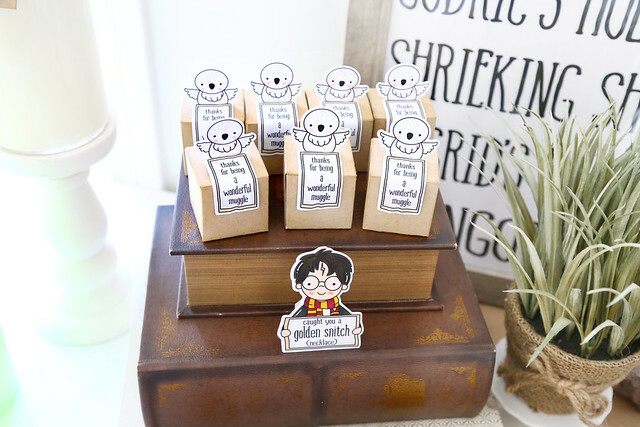 The Harry Potter digi stamp set can be found in my Etsy shop HERE. One of your best. This party was pretty incredible. Amazing decor, treats, entertainment and gifts. 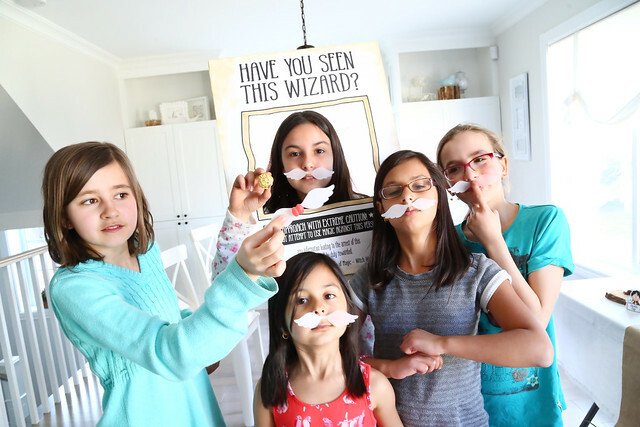 What a fun and amazing party for an 11 year old! You did an amazing job! This is absolutely amazing! Just love all the attention to details you added. 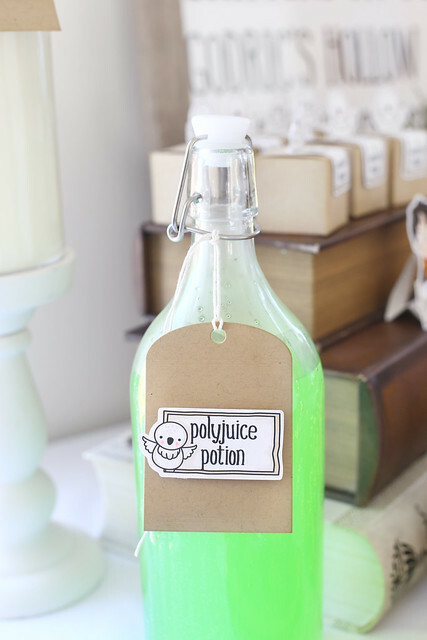 I am hoping my daughter wants a HP party when she's old enough, until then I may have to have a HP party myself! I love all of your parties! This one is fantastic! This is amazing! I'm in my 30s and I'd kill for a party like this! Lol! Totally, totally awesome!! You did a fabulous job. 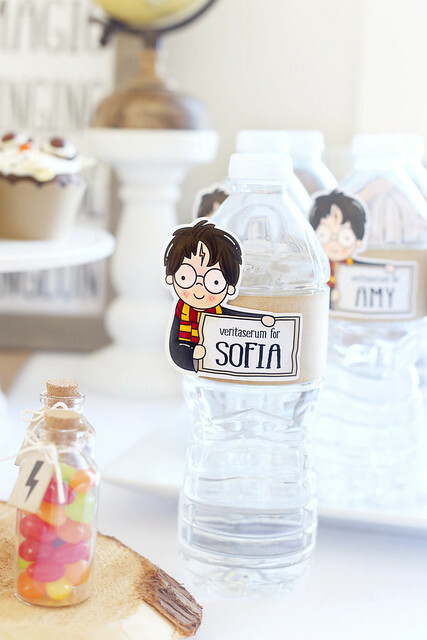 I want to have a HP party now. Nicely done!! this is just....incredible. i have no words. are u wearing a cape? coz you are the true wizard. I have no words for how absolutely amazing, cute, creative, clever and totally fabulous this all is! Your attention to detail is amazing!! So so so adorable!! All I can say is...YOU ARE AMAZING!!!! What a totally fabulous party! This is a truly an amazing job!! I am in awe of the way you throw a party! So many ideas with incredible attention to detail!! WOW!! So glad you shared. Please please please...can you prepare a party for me???? Did I say please?? Wow you really need to go into the party planning business! I love it! I am SPEECHLESS - this was fantastic, extraordinary, amazing, wonderful, incredible and just SO COOL!! You are delightful and I loved seeing this - Happy Birthday to your daughter!! Totally in Awe! So impressed and what a lucky daughter!!! I LOVE all of this!! 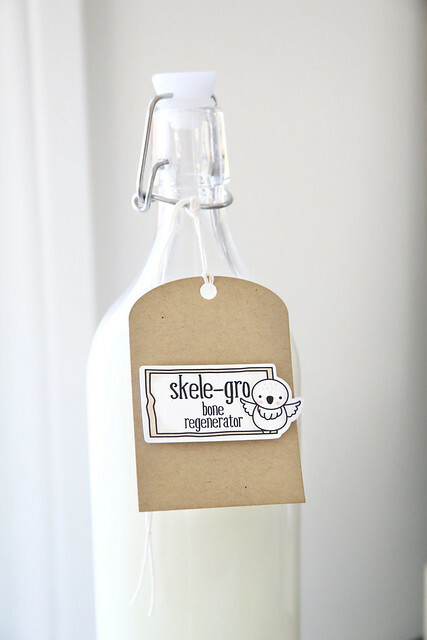 Could you tell me the name of the font you used for all the labels?!!? 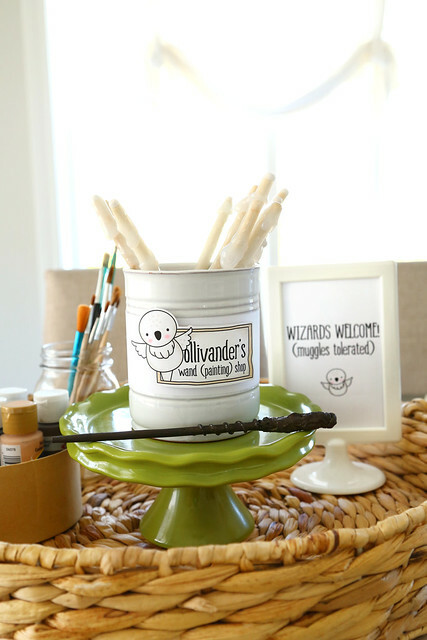 It's so fun and just perfect- my son is a big HP fan and so I might need to do a party for him! sure! it's called Bangers and Mash. Happy party planning! Where did you get the large sign?? lawn fawn meets xyron week! timber! a lumberjack birthday card.